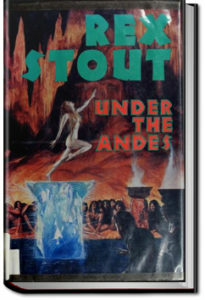 Under the Andes was written by Rex Stout years whose knack for weaving a fantastic tale of mystery and adventure will have most readers anxious for the next phase of adventure at every turn. The story finds two brothers and a pretty female companion on a journey which eventually takes them to a series of underground caves under the Andes of South America, where they encounter a lost tribe of Incas who have apparently survived hundreds of years oblivious of the outside world. The apparent ‘king’ of the tribe has become infatuated with the fair-skinned female intruder of the group and, well, suffice it to say there’s a lot of action, attempted escapes, heroism, and peculiar interactions between all, reminiscent of H. Rider Haggard with a touch of Edgar Rice Burroughs. This entry was posted in Action/Adventure Books on May 11, 2017 by allyoucanbooks.